Ryouga is a boy from "The Village of Protecting Time." He is training to become stronger so the mysterious being "Arcades" will take him to where his father is. Ryouga has superhuman strength. He is able to carry incredibly heavy items with relative ease and is skilled at hand-to-hand combat. These abilities may have something to do with the fact that he can transform into a half human, half Zekrom like creature by doing something called "Burst." When in this state, Ryouga's strength shoots up even more. Ryouga hates phrases like "that's impossible!" and "you can't!" Whenever he hears someone utter one of these, he becomes even more determined than ever to prove that person wrong. According to his mother, Ryouga's been this way for a long time. 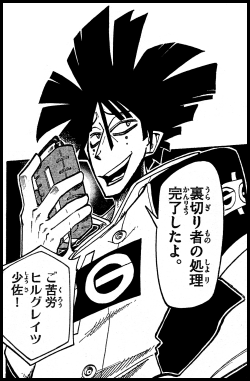 Ryouga first appears in Volume One, Chapter One. Miruto is a girl Ryouga meets just outside his village. Her mission is to investigate groups like the one who attacks Madoro City and report back on them. Her superior is a man named Jake (ジェイク). 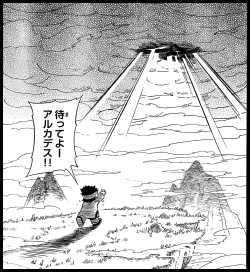 Miruto is the one who tells Ryouga about the situation in Madoro City. Later, she saves Ryouga's life by throwing a smoke bomb at Yaza and allowing him to escape. 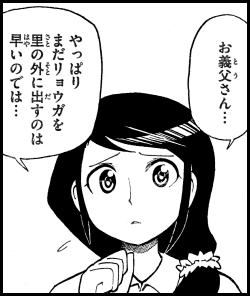 She also tells Ryouga about pokemon type match-ups. 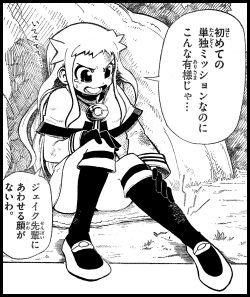 Miruto first appears in Volume One, Chapter One. Arcades is a mysterious voice that talks to Ryouga from the clouds. Not much is known about this entity other than the fact that it knows Ryouga's father. It promises the young boy to take him to where his father is if he becomes stronger. 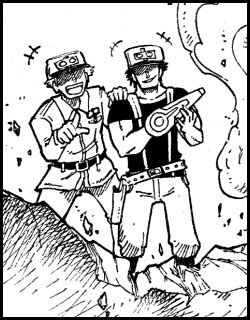 Arcades first appears in Volume One, Chapter One. Ryouga's father left "The Village of Protecting Time" to go on a journey to chase after bad men. According to Ryouga, his father worked to fight against those who would harm pokemon for personal gain. Before leaving on his journey, Ryouga's father gives his father a gem to pass down to Ryouga when he becomes of age. This gem triggers Ryouga's "Burst" transformation. Ryouga's father first appears in a photograph in Volume One, Chapter One. Yaza is the commander of the group that terrorizes Madoro City. By combining his modified ararebo with the energy from a group of fire-type pokemon, he creates a flaming weapon able to cause a great deal of damage. He is not above using dirty tricks to get what he wants; at one point in the story, he kidnaps a little girl and threatens to burn her to a crisp if Ryouga doesn't fight him. He is later referred to by Major Hilgreitz as a weakling for being beaten by a kid. Commander Yaza first appears in Volume One, Chapter One. Ryouga's grandparents are an elderly couple who appear to live with Haruna in "The Village of Protecting Time." They are Ryouga's grandparents on his father's side. The grandparents show interest in their grandson's performance on the Trial. 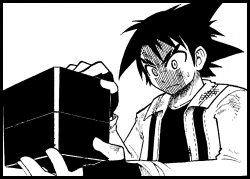 Later, Ryouga's grandfather gives Ryouga the gem that eventually triggers his transformation into the half human, half Zekrom creature. Ryouga's grandfather was given the gem by his son, Ryouga's father. 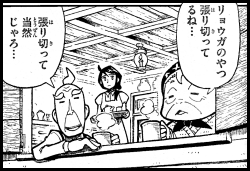 Ryouga's grandparents first appear in Volume One, Chapter One. Haruna is Ryouga's mother. After Ryouga's father left on his journey, Haruna has been worried that her son will follow in his footsteps. At this point in the series, she hasn't explained why. Later, Haruna recognizes her son's ability to transform into the half man, half Zekrom creature. Haruna first appears in Volume One, Chapter One. The Great Gavel organization is a group that steals pokemon and performs experiments that includes converting their life energy into weapons. 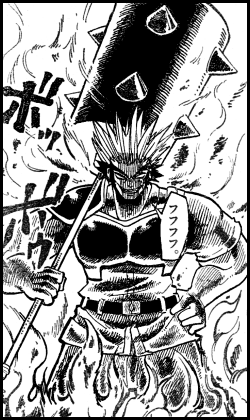 They are first encountered by Ryouga in Madoro City, where the group is causing damage to the city and its inhabitants. They have no qualms about using force to get what they want, even if it's against children and the elderly. The group has seven "warriors." One of them is Major Hilgreitz. As of the most recent chapter, the origin of the group's name is unknown. Great Gavel first appears in Volume One, Chapter One. Major Hilgreitz is first seen taking out a group of men trying to desert the gang they're members of. He has the ability to Burst with a Doryuuzu. The Major becomes excited at the idea of battling "the original Burst warrior." It seems as if he's gotten bored with his opponents up until that point and is hungry for the challenge the battle promises to provide. He thinks very highly of himself and loves talking down to his opponents. Hilgreitz refers to himself as one of the "seven warriors" (七戦騎) of Great Gavel, but the meaning of this declaration has not been made clear yet. Major Hilgreitz first appears in Volume One, Chapter Two. Tougo is a treasure hunting adventurer who comes across Ryouga at the foot of Mt. Serables. He's ranked fourth in the world of treasure hunting adventurers and reminds everyone of this fact every chance he gets. His partner pokemon is a Dentula. Tougo thinks of himself as a professional but is really just an oaf. He loves to brag and show off his physique, but when it comes to actually climbing the mountain, he's happy to have his Dentula do all the work. Tougo also tends to ramble a bit, causing his audience to ignore him and go ahead without him. He's not completely useless, however, as he does help Ryouga defeat Major Hilgreitz at the summit of Mt. Serables. 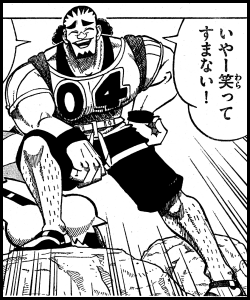 Tougo first appears in Volume One, Chapter Three. 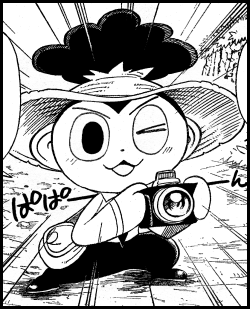 Yappy aims to be the world's best journalist. His unusual appearance caused Ryouga and Miruto to mistake him for a Yanapp, but in reality he's just a strange looking human. He only looks out for himself and has no trouble turning on his companions if it'll benefit him in some way. Despite all this, Ryouga decides to let him travel with him and Miruto anyway. Yappy carries Potion around with him, but it is currently unknown if he actually has any pokemon on which to use it. 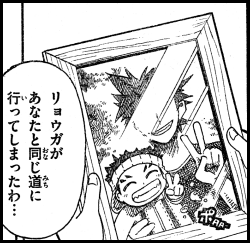 Yappy first appears in Volume One, Chapter Seven.